Everyone knows Harry Belafonte as a folk-singing troubadour and tireless champion of civil and human rights; but few are likely familiar with his surprising jazz roots. In his recently-published memoir, My Song (Knopf), Belafonte chronicles his spectacular rise from dirt-poor Harlem youngster (by way of Jamaica, where he was partially raised) to international icon, his deep personal friendship with Dr. Martin Luther King and his fervent support, personally and financially, for freedom-fighting the world over. But Belafonte also goes into great detail about a little-known chapter of his pre-megastar life: his career-launching days along 52nd Street, and the jazzmen who made his entrée into the entertainment industry possible. The setting was postwar Manhattan and Belafonte, newly married to first wife Marguerite, was struggling to establish himself as a stage actor, barely making ends meet by pushing racks of clothes in the garment district. One of his favorite places to hang out was the Royal Roost, nursing a single beer at the end of the bar while watching Ella, Miles and other greats. He was a frequent enough visitor to become friendly with the Roost’s resident promoter and booking agent, Monte Kay, and several musicians, forming a particularly close bond with Lester Young. One night, when Belafonte expressed frustration with his acting career’s lack of momentum, one of Young’s sidemen suggested he ask Kay for a gig. Though Belafonte had sung in stage productions, he didn’t think of himself as a singer. But Kay agreed to the experiment, suggesting that Belafonte perform at the Roost during intermissions, offering him scale at $70 per week (a fortune compared to the pittance he was earning on Eighth Avenue). Kay also asked Young’s pianist, Al Haig, to help the neophyte vocalist work up a reasonable playlist of standards. Belafonte added one original, “Recognition,” about the struggles of black veterans recently returned home, that presaged his commitment to social activism. On his opening night, Belafonte sweated backstage, nervously waiting as Young finished his first set. Introduced by Kay, out he strolled, followed by Haig, who had agreed to accompany him. Before he could utter a note, Tommy Potter joined them and picked up his bass. Then Max Roach returned to the stage and settled behind his drums. Finally, Charlie Parker emerged with his sax. Four of the biggest names in jazz had, without a word to Belafonte, secretly planned to give his debut an unforgettable boost. The crowd was appreciative enough of Belafonte’s easy vocal style that his one-week gig was extended to two, then three, then ultimately 22 (though, after that stellar opening night, he performed alone with Haig). Fortunately, the Roost was also where jazz’s foremost DJ, Symphony Sid, broadcast from. Sid, as eager as the musicians to help Belafonte out, plugged him on air and, assuming co-responsibility for his management with Kay (with neither accepting payment for their efforts), helped arrange his first recording session, for the newly-formed Roost Records. A few months later, in July 1949, he was signed to Capitol. A series of 78s followed, mostly covers of standards like “Close Your Eyes” and “They Didn’t Believe Me,” though none gained much traction. 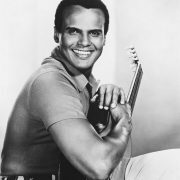 (In 2009, DRG issued Harry Belafonte: The Early Years on CD, including 11 of his rare Capitol tracks, plus an additional 11 tracks by calypso star Lord Flea). Soon, Belafonte was being booked into posh supper clubs across the country. Yet, despite his escalating success, he didn’t feel comfortable as a Billy Eckstine-esque crooner. In the fall of 1950, Kay landed him a two-week gig at Martha Raye’s Five O’Clock Club in Miami. For the first time, he came face-to-face with the racism that headliners like Lena Horne and Nat “King” Cole had been subjugated to for years. Angered at having to entertain white audiences (and expressly told not to fraternize with the customers, especially the white women who made up most of his admirers), then being escorted to the black side of town and a third-rate motel room, Belafonte quit after seven days and headed home to New York. Immediately upon his return, he informed Kay that his days as a pop singer were through. Two years would pass, during which his regular attendance at political rallies and protests acquainted him with the work of Pete Seeger, Josh White and other legendary folk artists. Inspired by their performances, he recast himself as a folk singer (adding reworked songs from his Jamaican youth to his repertory), convinced the Village Vanguard’s Max Gordon to take a chance on him and, in October 1951, began his meteoric rise to superstardom.